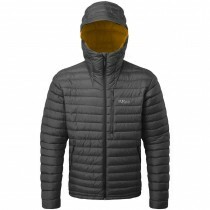 Rab's Microlight jackets have been tried, tested and loved by Outside staff and customers for over a decade. It's time to meet the next generation. The Microlight has undergone subtle improvements over a decade of evolution. Deconstructed, analysed and carefully rebuilt, every tiny detail has been honed. Introducing the new Microlight Summit. Using an innovative new Pertex Infinity Weave fabric, the Summit harks back to the original jacket’s purpose - pure alpinism.